Afrai writes m/m and f/f slash, het, and gen for BLEACH, Good Omens, The Hitchhiker's Guide to the Galaxy, and various other fandoms. She also makes lovely and odd LJ icons. She does not like it when people put 'Afrai' instead of 'afrai,' but she is kind of used to it. Carmarthen is a fannish butterfly who writes m/m and f/f slash, gen, and het for numerous odd fandoms and a few common ones. At present she is most fixated upon Star Wars, Pirates of the Caribbean, Goldeneye, and Tamora Pierce's Tortall novels. Here you may also find an incomplete compilation of creators' quotes regarding fanfiction, slash, and subtext. 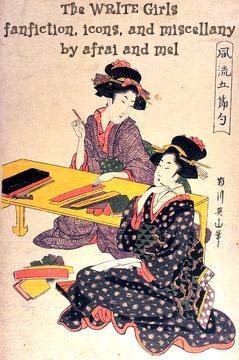 The print of the Japanese women comes from here. All text and web design, in regards to thewritegirls.populli.net is Copyright © 2000-2007 "Carmarthen" or "afrai", unless otherwise noted. All other trademarks, characters, pictures, and music cited and contained herein are the property of their respective owners.